Human Metapneumovirus (HMPV), along with Respiratory Syncytial Virus (RSV), is a common cause of lower respiratory tract infection in children worldwide. HMPV is an enveloped, negative single-stranded RNA virus belonging to the genus Metapneumovirus, of the family Pneumoviridae. The virus can affect the upper and lower respiratory tract of children and adults but can cause severe disease in children, the elderly and immunocompromised patients. 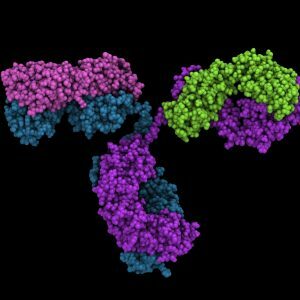 The Native Antigen Company offers highly specific HMPV monoclonal antibodies to support research and immunoassay development. Human Metapneumovirus (HMPV) is an enveloped, negative single-stranded RNA virus belonging to the genus Metapneumovirus, of the family Pneumoviridae. HPMV is closely related to Respiratory Syncytial virus (RSV), which belongs to the genus Orthopneumovirus within the same family (Alfonso, CL). Human Metapneumovirus is globally widespread and is seasonal in temperate climates, being most active from winter to spring. Genomic analysis has shown that HMPV exists as two genotypes A and B, which are further divided into subgroups A1, A2 and B1, B2. Each of these subgroups has a distinct geographical distribution but may circulate separately or concurrently (Boivin, G). Transmission of HMPV from person-to-person predominantly occurs through contact with airborne droplets from an infected individual, produced by coughing or sneezing. It can also be spread through contact with contaminated hands or surfaces. Identified in 2001, HMPV, is one of the most common causes of paediatric lower respiratory tract infection. However, the virus can affect individuals of all ages infecting the upper or lower respiratory tract. The symptoms of HMPV infection include coughing, fever, wheezing and shortness of breath but in some cases bronchitis or pneumonia can develop. HMPV can cause severe life-threatening illness in paediatric, geriatric and immunocompromised patients (CDC). Diagnosis of HMPV infection is commonly performed using molecular and serological techniques. Currently, there is no licensed vaccine available for the prevention of human Metapneumovirus infection and no antiviral treatment for the disease. Centers for Disease Control and Prevention: The national respiratory virus and enteric virus surveillance system. Human metapneumovirus (HMPV) clinical features. The Native Antigen company offers monoclonal antibodies specific to the Human Metapneumovirus (HMPV) and which are suitable for the development of immunoassays.